NOTE: I have been struggling with internet connection so am posting this a day after it was written. It’s Sunday, and it’s Chinese New Year’s Eve. Which probably means I should be heading down to Chinatown. Except I’m not, because it’s going to be mental – everyone heads there apparently – and I’m quite enjoying the peace and quiet of new my apartment. I moved in on Thursday; I’d had the keys for a few days and came up last weekend to start dropping off some clothes but as I didn’t bring any furniture from the UK and the apartment only included wardrobes, and as I didn’t fancy sleeping on either a tiled floor or in a wardrobe, I had to wait until my bed and settee were delivered before moving in, which was Thursday. I actually had a mad panic last week when I realised Chinese New Year was coming up which means everywhere is busy, and I had no furniture, so I went to IKEA one evening to order said bed and settee – the essentials. Just as well, Thursday was the earliest they could deliver and assemble it; this was also the day I had to be out of the serviced apartment. They could have delivered it earlier, but I’d have had to assemble the furniture myself. Can you imagine? I can, and it’s not pretty. It took two blokes who knew exactly what they were doing about an hour and a half which suggests I’d have still been at it now. Turns out they also wanted an extra $60 when they got here to bring it up the stairs! To be fair, there are 42 stairs and no lift. Carrying a queen size bed, large TV stand, settee and bedside table is no mean feat. There was a lot of sweat and panting and cries of ‘too many stairs!’ involved. I mentioned there are a lot of stairs and no lift. The apartment I’m in – at Royalville – is what’s known as a ‘walk-up’; it’s an older development (1988 I think – anything pre-2000 is considered old in Singapore) which means the apartment size is pretty big. Believe it or not I have more floor space than in my terraced house in Manchester, although rent is significantly more expensive. Apparently a lot of people won’t consider a walk-up as they prefer lifts. I definitely prefer space, I wanted a big front room to accommodate the birds when they finally arrive (more on that later), a balcony, and ideally two bedrooms. I’ve got all that, plus two bathrooms. Yay! In fact, I don’t even know what I’m going to do with all the floor space in my front room. I’m sure I’ll find some tat to fill it. Here are some pics. Did I mention there’s a pool and a gym? I’ll get use out of the pool, but I have no intention of setting foot in the gym. It’s so good to finally be in my own place rather than the serviced apartment. It was nice enough, and really convenient as it was walking distance from the office, but it felt like living in a hotel. Have you ever tried living in a hotel for a month? You can’t really settle. And the apartment just wasn’t me. It also wasn’t very big, as I mentioned in my last post. I now just need to get some more furniture – an outdoor chair and table for the balcony, a TV (!) and a dining table, plus a few other bits. Whether I’ll use it for dining is another question, but I will use it for sewing on when my sewing machine arrives. Which will be early in March, it’s coming by sea. I hope it’s got its armbands on. I’ve bought a few things like cutlery, a kettle, a sweeping brush, and a frying pan. It’s a deep one though, and as I’m not planning on cooking much it’ll probably be the only pan I’ll need. I reckon it’s deep enough for poaching eggs. I could do with a microwave though. The only downside at the moment is I have no TV box (and actually no TV set), and no internet until 22nd Feb. I had some engineers round on Thursday to install a cable for the broadband and I have a hard drive of films to watch but no wifi for a couple of weeks! I’m having to make do by tethering my phone, but it’s not ideal, especially when you want to Skype or upload a blog and photos to WordPress, so I’m having a bit of an enforced digital semi-detox. Unlike the constant noise when you live in the CBD, it’s nice and quiet here. I’m currently sitting with the balcony doors open (are you jelly? ), the fan on in the front room and all the windows open, so there’s a nice breeze; I’ve only really used the aircon at night when I’m in bed. Although there’s a main road round the corner, and I’m a 3 minute walk from the MRT, there’s no road noise, it’s all nice and green and there’s plenty of wildlife about. I found a baby lizard running around my kitchen last night; I was so glad it wasn’t a cockroach, it was dark so I literally leapt into the air when I spotted it legging it across the floor. It ran under the washing machine and I couldn’t find it, and I quite like lizards so I left it. I made sure I shut my bedroom door though in case I woke up with it sitting on my face. There are also plenty of birds around. These range from sparrows (a few were sitting on my balcony looking expectantly at me earlier), Javan Myner birds which are very common in Singapore, and also a few parakeets. I keep seeing a couple of bright green ones flying past and going sitting in a nearby tree. They look and sound so much like green versions of Mel. Awww. On the Mel and Kev situation (they’re not an 80s pop duo, they’re my parrots who I’m trying to bring out here), there is light at the end of the tunnel. Some of you might know that I’ve had some drama with this over the last few weeks as there’s currently an embargo on importing birds from the UK to Singapore due to bird flu in the UK in the last few months. I was dealing with a woman in the UK (who shall remain nameless) who was supposed to be helping me. I get the impression she hadn’t actually bothered to check anything she was telling me, and the last contact I had with her involved her telling me that the ban had been in place for several years (this was news to me, despite dealing with her for about three months), it didn’t look as though it was going to be lifted, and so it ‘might be prudent to consider rehoming the birds’. The birds are part of my family. I wonder how she’d have responded if I told her to consider rehoming her children. I didn’t have anything nice to say at that point, so I ignored the email she sent me and I still haven’t replied. Instead I spoke to the lady from the relocation company in Singapore who’s been really helpful and she gave me a contact at a different company out here. After a few emails I got a phone call from a lady at the AVA (Agri-Food and Vetinary Authority) last week who informed me that the embargo of bringing birds from the UK might be lifted at the end of February or beginning of March, so I should check again then, and if it isn’t lifted I can make an appeal to bring them over anyway. In your face, unhelpful UK woman. Seriously though, I’m soooo pleased. I can’t wait to have them here. I’ve spoken to Kev on Skype and he’s wolf-whistled at me but I’m not sure he really knows what’s going on. In other news, my first hairdo has gone well. This may seem trivial to you, but I can assure you, it IS NOT. I went on Internations which is a networking site I’ve joined and searched the forums for blonde hair until I found a post recommending a hairdresser near my new apartment. Turned out to be a good recommendation. Just as well, I’ve had to have new pics taken for PR we’re doing at work about the new office. There’s a PR piece here, and here’s a picture of me looking all business-y and Singapore-y. You wouldn’t believe how many shots were taken to find one I liked. Let’s just say there were a few. Speaking of Internations, I’ve been to a few social events so far. The first was wine tasting on someone’s rooftop terrace. It’s a strange one when you’ve paid a complete stranger $58 in advance to turn up at their house for supposed ‘wine tasting’ not knowing them or whether they’re genuine or a total freak who you’ve just paid to kidnap you. As it happened, it was a great night with some fab wine. The guy who organised it is a wine importer and definitely knew his stuff. I knew the white wines, failed on the reds, and when it came to a blind tasting (with blindfolds – fortunately this was not the first round or I’d have been off quicker than you can say ‘expensive wine’), we had to guess what colour the wine was. You may think there are just three colours but it turns out, orange wine is a thing. It tastes a bit like sherry. Last Saturday I went to another event at Berlin Bar which was billed as an Eagles tribute act, starring Singapore’s biggest rock star from 20 years ago. I think they did one Eagles song and then played stuff like Coldplay and Maroon 5 for the rest of the night. It was pretty good though and I met some nice people. I ended up at 1 Altitude – about 60 floors up and with panoramic views of Singapore – out with a woman I’d never met before called Kim until about 3am. Good times. I have no idea how much I spent on wine and I don’t intend to check although I know it was $55 (about £24) to get into One Altitude and we didn’t get there until at least 1.30, several hours – and wines – into the night. Yikes. The night before I went to a Friday social (with some people I met at a work networking event) which was an even later night. In fact, it was so late the McDonald’s chips I’d been dreaming about eating on the way home didn’t happen. You know it’s late when they’re only serving breakfast. I had to make do with an egg McMuffin and a hash brown. As a result (of late nights and drinking, rather than the hash brown), Sunday was a complete write-off. I’m getting too old for two nights on the bounce. I don’t suppose it’ll be the last time though. While I’ve met some really genuine people on Internations, I’ve had quite a few people trying to get in touch with me who are ‘financial consultants’ who think my job and company sounds ‘really interesting’ and would I tell them more about it? I wasn’t born yesterday, I’m 99% certain they’re just trying to flog me financial products I don’t want. At least they’re (probably) harmless. But here’s an interesting one…I think someone is trying to catfish me. Seriously. I got an email through Internations a few days ago from someone purporting to be Canadian who had recently moved to Singapore. He said hello, his picture looked pretty normal, I emailed him back. I decided to look him up on LinkedIn to find out more about him. No results. Which was weird because he has a very unusual name. So I Googled a bit more (other search engines are available), and still nothing. Even weirder. I went back to the email he’d sent me and re-read it. There was something about the language he’d used in his email which didn’t seem very Canadian – grammar etc., even thought it was a short email. Maybe I’m a suspicious person or maybe I’ve watched too much Catfish, but I took his profile picture and ran it through Google images. Guess what? Plenty of results, but not with his name. It looks like it’s some (genuine looking) dude from the US, with a totally different name. He’s on LinkedIn, and the pic crops up in a few other places too, so it looks genuine. I went back to catfish man’s profile on Internations and saw he had a couple of other pictures. Even weirder, next to these pictures it says ‘here are some pictures so you can see my face’. Who would write that??! And guess what? They’re also pics of the guy from the US. NOT the guy claiming to be emailing me. At this point though, I’ve already replied. Gutted. Won’t make that mistake again, next time I’ll do a bit of online stalking before replying. He’s emailed again since, a longer email, more grammatical weirdness, basically saying he’s looking for a friend to explore Singapore with and asking if I’m single and fancy meeting for lunch (it was significantly longer than that, but that’s the gist). So what do I do? I want to call him out and ask him who he really is and why he’s using someone else’s pictures, and anyway I feel like I should tell the genuine guy in the US that some weirdo’s using his photos, and then report him to Internations. Should I email him back? If I do, what do I say? I spoke to one of my friends the other day who said just ignore it, but I’d want to know if someone was using my pics, wouldn’t you? Answers on a postcard please (or in the comments below, I don’t know how long a postcard will take to reach Singapore). In other news, today I’ve been to Singapore’s Botanic Gardens. I was supposed to be meeting some people from Internations to do yoga there at 8.20am. It was raining so I nearly didn’t bother, but since I’d dragged myself out of bed and got ready, I did. It turns out everyone else had more sense than going out in pouring rain to do soggy yoga as I was the only one there. So instead I had a nice breakfast at one of the cafes and a good explore round the gardens, and took some photos. It’s been ages since I’ve been out with my camera properly so it was good to get back on it again. Here are some of my favourites. I’ve only got one lens with me at the moment (24-105mm) so it’ll be great to go back with my macro lens when it arrives (it’s in the shipment with my sewing machine) for better close-ups of the insects and plants. They aren’t too shabby though. Incidentally you can walk around a jungle/rainforest section of the gardens; this is what Singapore was originally like before it was developed. So I had a wander around there. You can still get 3G. I bet there aren’t many rainforests where you can say that. Aside from that, because it’s Chinese New Year, tomorrow and Tuesday are public holidays here so I now have another two days off. Nice! Not sure what I’m up to yet, but it’ll involve more exploring of Singapore. And possibly some beer. Which is cheaper than wine. It’s worth saying a couple of the pictures were taken through glass, and you can see some flare in the photos. But it was great to get up close to some of the birds, like the Eclectus, the beautiful green one above, especially in the treetops aviary, a covered (with a net) outdoor area where the birds fly around and sit on the walkways as you walk around and past them. It’s great to see and hear them so close up. As well as birds the park is also home to other animals like chimpanzees, meercats, tigers, dolphins and tortoises (which I also have a thing about – they had giant torts too; amazing animals, they’re like dinosaurs when you see them up close, but weirdly just like super gigantic versions of my Horsefield tortoises). Some of the birds definitely had a sense of humour – as well as some we saw deliberately winding each other up, one in particular kept dancing at us as we walked past – and went a bit crazy with some strange body-popping head moves when we stopped at his cage; he seemed to be loving the attention (he got a few ‘hellos’ from us as well as the Greys). It’s peak breeding season for many birds on the Farne Islands in July, so if you take a boat trip from Seahouses out to Inner Farne as I did this weekend, expect to be dive-bombed by territorial Terns as soon as you step foot ashore – their nests surround the pathways. Take a hat or hood to avoid a direct peck to your head, or failing that keep wigging your hands near your head – not enough to scare the birds, just enough to stop your head looking like an easy target! The island is home, at least at this time of the year, to literally thousands of nesting birds of several different species, including various Terns and Gulls, Guillemots, Shags, and Kittiwakes, amongst others. Seals bob around in the water around the islands but weren’t easy to photograph; maybe they were camera shy. And of course there were the puffins. The puffins were the best bit of the trip for me. Bright legs and parrot-like beaks (they are known as Sea Parrots – and have the interesting nickname ‘Tommy Noddy’ locally), portly stature and waddling gait, they are a magnificent sight. More so because of their numbers; there are around 40,000 pairs currently nesting on the island. 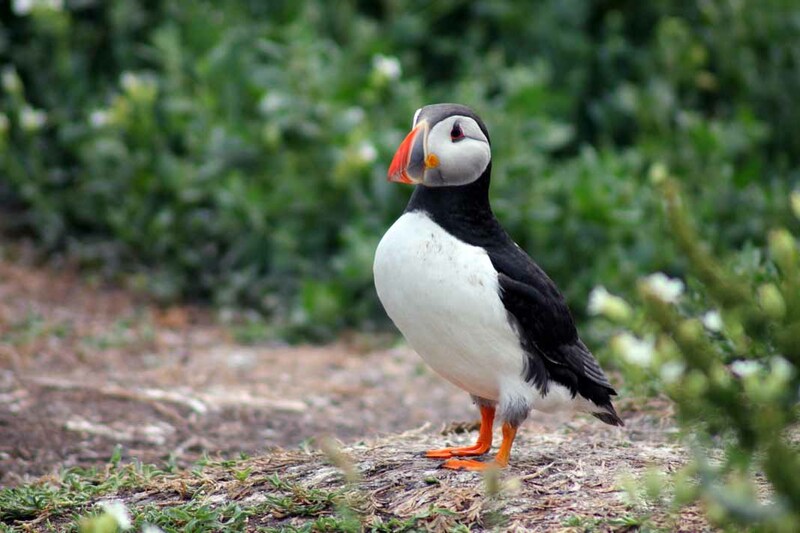 Visitors can see them sitting contentedly on the island’s rocks and walls, as well as in burrows on the ground, and then flying around across the sea. They can fly so low they sometimes look as though they’re only just managing to stay above the waves, before bringing fish back to their burrows (borrowed from the local rabbits who must be evicted at this time of year) and disappearing down them to escape a mugging from the gulls while they eat. I haven’t finished editing yet but here are a few initial photos from the 550+ (!) I took in what was basically a day and a half in Northumberland, visiting Dunstanburgh Castle and Inner Farne…glad I took so many though, because birds can be challenging to photograph so there was a bit of experimentation with shutter speeds and framing, which means there are quite a lot which didn’t turn out. But enough that did, which is the main thing. Being a bit trigger happy has its benefits sometimes, it would seem.